Cranes-UK offer Monorail Wire Rope Hoists for single girder applications with Capacities up to 25 Tonnes from Stahl Cranes. The SH range of wire rope hoists features ultra compact dimensions to provide optimum room and clearance when operating in confined areas. 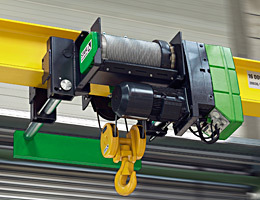 Not only for indoor use the Stahl Single Girder Wire Rope Hoist can be manufactured for operation outdoors with IP66 protection levels that protect the motor and components from the weather, we are also able to offer hoists designed for extreme conditions and explosion proof atmospheres.